It’s Sunday morning. Which is, traditionally, supposed to be the very epitome of leisure. But I’m about to go to work. Because, well, just because. 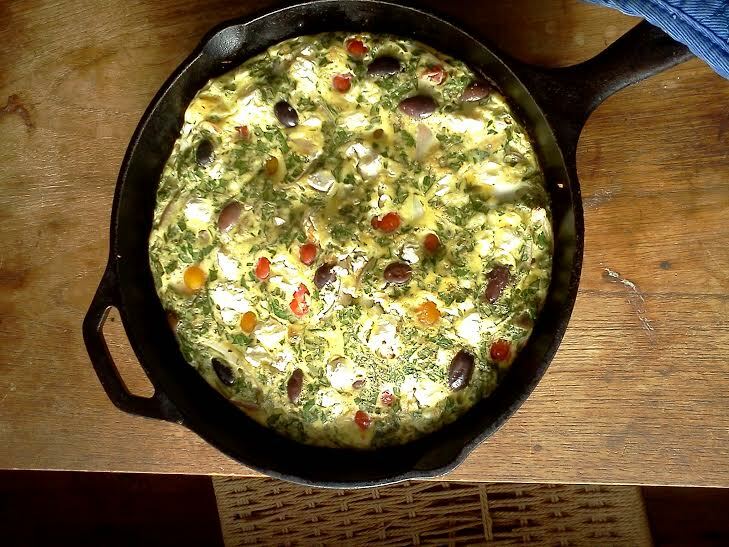 Too many uninteresting reasons to spend time writing about here, now, when what I want to do is tell you about this delicious, easy, beautiful, and nourishing frittata. Today is, I think, the third time I’ve made it. Because, like every other recipe I’ve tried from Dale Pinnock’s The Medicinal Chef, this frittata is terrific. But today differs from the other times because today I added beans. Yup. Cannellini beans. On a whim. Because I had some left after my most recent batch of cassoulet. And it was so good that I decided to share the recipe, which differs from the original only in the addition of yogurt, beans, and feta cheese, which I also happened to have in the fridge, and a few details about how to cut the onions. Some people buy shoes. I buy groceries. Then stress about how to cook and eat everything before it goes bad. Sigh. This morning, when I was cooking, it occurred to me that I probably should have had children. Or maybe I should live in a commune. But, well, I really like living alone. So I guess I’ll just keep on as I am. It will work out. Okay. Now. Here’s the recipe. Preheat the oven to 400. Heat the olive oil in a medium sized skillet over medium-high heat. Saute the onions for a couple of minutes, reduce the heat to medium, add the tomatoes and garlic, and saute for another 2 or 3 minutes. Add the olives. Whisk the eggs and yogurt together in a medium-sized bowl, season moderately with salt and pepper (the olives and feta cheese are both pretty salty, so you don’t want to overdo it), then add the herbs. Pour the egg mixture into the skillet. Move the tomatoes and olives around so you don’t have a clump of one ingredient. Add the beans and cheese, if using, to fill in the blanks. Reduce the heat to low and continue cooking on the stove for another 5 minutes, then transfer to the oven. Cook for 10-20 minutes, until the top has puffed but before it browns. Remove from the oven and let stand for a few minutes. Transfer to a plate or serve directly from the skillet. Despite the almost slogan-like title, these muffins are delicious, solidly structured with a perfect balance of sweetness that’s just right for breakfast. Or at least so I believe. But I could be wrong. Because I made them yesterday for a brunch that wound up being cancelled at the last minute. So no one but me has tried them. And I have a cold. Which brings my palate into question. Still. I’m pretty sure they’re good. 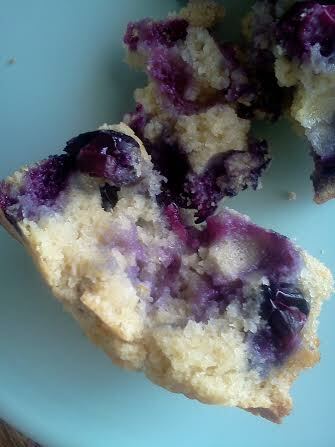 And I’m certain that they’re good for you, full of whole grain flours, coconut oil, and blueberries. And free of all those trendily objectionable ingredients. Indeed, my original goal was to make free muffins that were vegan to boot. But that version (the little sunken lava cakes pictured on the right) refused to rise or even cook all the way through. So I gave up. Used eggs. Because, while the problem with version #1 may well have been an excess of blueberries, I was in a rush, and just didn’t trust that ground flax seed and water can really provide the structure eggs lend to baked goods. And I have no regrets. Because the end result turned out perfectly, with a crispy rounded muffin top, a tender crumb, and a rich bite that reminded me of a much less sweet form of pound cake. All that and the recipe includes beans! Sort’ve. Here’s what I did. My mix is based on a thoughtful post from Gluten Free Girl and the Chef. (http://bit.ly/1fARZsO) I discovered the site a couple of years ago after Shauna (Gluten Free Girl) and Danny (The Chef) Ahern published their first book, Gluten Free Girl and the Chef: A Love Story with 100 Tempting Recipes. (http://bit.ly/Lrhj9I) In addition to great recipes, both their books and their blog include a ton of useful information about living well on a gluten-free diet. Plus their entire life seems like a sweet love story that is real and true and thus inspiring. So that’ s nice too. But I digress. If you read Shauna’s post, which I encourage you to do, you’ll see that she and the Chef don’t like bean flours. Which gave me pause. 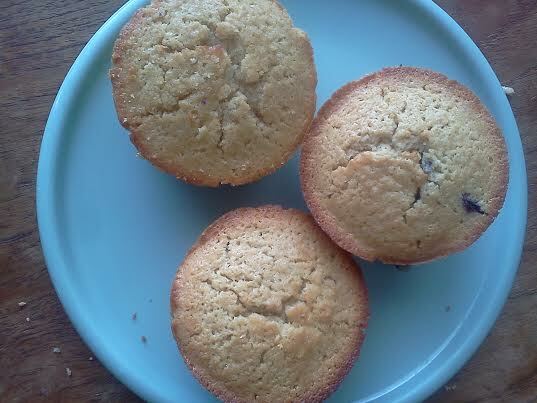 I wanted to use garbanzo bean flour so that these muffins could include beans. That seemed like the only way I could avoid feeling like a total fraud for posting this recipe on my bean blog. Yet I didn’t want to make something icky. What to do?! For this first time, I decided to risk the garbanzo bean flour. For the sake of the blog. Happily, my gamble paid off. Next time, though, I’ll probably try a different blend. Just to see. Preheat the oven to 350 and grease a 12-cup muffin tin with a little bit of coconut oil. Whisk the flour mix, baking powder, and salt until well blended. In a separate bowl, whisk the coconut oil, syrups, lemon zest, eggs, and milk together until well blended. Stir the mixture into the dry ingredients. Fold in the blueberries. 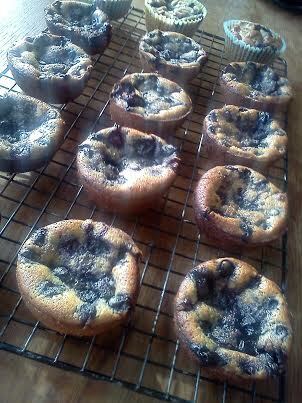 Using a 1/2 cup measure, spoon the batter into the muffin tin, filling each cup almost to the rim. Bake for 30-35 minutes, until a knife comes out clean. Cool for 5 minutes in the pan, then cut along the sides and pop out to cool on a rack. This morning, near the end of a three-hour Kundalini class, when I was meant to be deep in meditation, I started laughing out loud, realizing that the title of this post, a literal description of today’s breakfast, would fit perfectly into the sketch show I’ve been working on for the past several months. (And which is finally almost finished!!!) So many health-food buzzwords crammed into a single recipe title, and all of them modifying the ultimate empty calorie breakfast food, pancakes. This recipe sounds like it would taste awful. So much so that it’s hilarious. And yeah. This may be the first time ever that I’m posting a recipe for which the photograph makes the food look better than it was in real life. But while I admit that these weren’t the best pancakes I’ve ever tasted, they were far from the worst. In fact, they’re pretty good so long as you cover them with enough fresh fruit to ensure that each bite includes at least equal parts fruit and pancake. And maple syrup. The truth is that I’d probably appreciate these much more if I did not have the luxury of a digestive system that tolerates gluten just fine, or if I was actually vegan. Because while the end result of this experiment is not light or fluffy, and a hint of beany flavor comes through if you don’t get enough fruit and syrup in each bite, they are pancakes. And who doesn’t love pancakes? Well, okay, I don’t. They just don’t compare to waffles, which I love without condition. 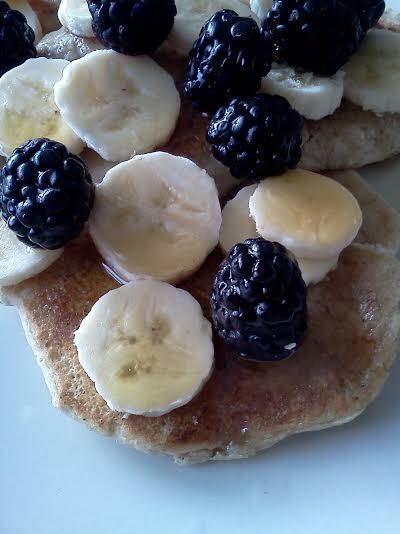 But when I saw Kathy Hester’s beany pancake recipes, I knew I had to give them a try. (http://bit.ly/JP2DjX) Especially because I’ve had gluten-free pancakes in the back of my mind for almost a year now, since I saw this recipe for flax coconut pancakes in Food and Wine. (http://bit.ly/1dfRbcJ) So I decided to combine the two recipes, coming up with my own version. Which I ate this morning, a couple of hours before yoga. The end result may not have been the very best pancakes I’ve ever tasted, but, as I said at the start, they were tasty enough. Especially given the title. Note that the following recipe calls for several different types of flour, all of which I happened to have on hand. Because a while back I became interested in gluten free baking, trying to pack more nutrition into the baked-good punch. If you aren’t so stocked, however, please just use whole wheat pastry flour or even regular white flour. Although the nutritional value will decrease, I’m guessing the texture will improve. And it will definitely be less expensive and troublesome than going out and buying all these fancy flours. Now, here’s the recipe. 1. Whisk the dry ingredients together in a medium sized bowl. 2. Using a food processor or immersion blender, puree the beans, milk., oats, oil, syrup, flax seed mixture, and vanilla together until smooth. 3. Stir the pureed bean mixture into the dry ingredients until thoroughly combined. 4. Heat a skillet (I always use cast iron, because that’s what I have, but use what you like) over medium heat. For each pancake, scoop about 3 T. of batter into the skillet, making sure to leave space around each pancake. Cook the pancakes for 3-5 minutes on each side. Serve with fresh fruit and maple syrup. This makes a lot but they should freeze well. Enjoy! Once again, I’m posting a non-bean recipe. Apparently this is a new trend. Which I’m justifying because it fits my overall approach to cooking and eating delicious food that makes me feel good both during and after the meal. Plus it’s Christmas, and the friends I usually celebrate with are out of town. This year, it’s just me and my mom. So I decided against an elaborate holiday meal. A big dinner, normally something I adore doing, just seemed like too much for two people. But I wanted to do something special to mark the occasion. After considerable thought, I settled on overnight waffles. Everyday waffles, the kind that, provided you have a waffle iron, come together in a half hour or so, are perfectly great. But overnight waffles, which require yeast and forethought and which I’d never made before today, seemed sufficiently festive to qualify for a holiday breakfast. I got the idea from the “Make-Ahead Breakfasts for a Crowd” article in the December 2013 issue of Fine Cooking. 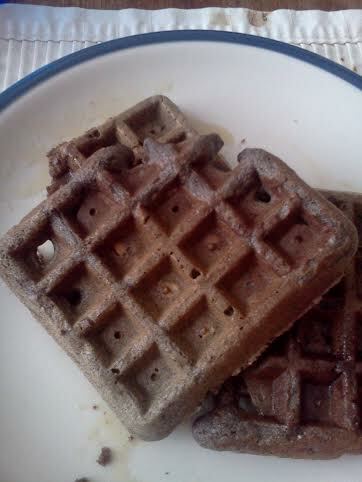 Although the original waffle recipe sounded wonderful, I decided to substitute pecans for the bacon. I am in the enviable position of having several pounds of fresh pecans, which my mother brought up with her from Florida. I’ve had pecan waffles once before, in Atlanta. And they were out of this world good. So that was an obvious choice. But, while I didn’t have bacon, I did have bacon fat in the fridge from two weeks ago, when I made deviled eggs for a friend’s holiday party. Accordingly, while these waffles do not have any actual meat, they are decidedly not vegetarian. However, I did not really taste the bacon. So I don’t think you would lose anything by leaving it out and making these with butter. If you’re in the mood to experiment, I also think you could easily make these gluten-free by subbing a combination of gluten-free flours for the whole wheat, perhaps brown rice flour, tapioca flour, oat flour, or potato starch. Or something else. Check out this post from glutenfreegirl. (http://bit.ly/1c5TlKs) If you do experiment, please let me know how it turns out. I will do the same. As with my version of Fine Cooking’s granola, in making these waffles I took liberties with ingredients but followed the method of the original recipe. And, like the granola, this was a great success. Unlike the granola, I probably won’t make these on a regular basis. But, because I’m not cooking for a crowd this year, I was able to fill a large freezer bag with waffles that I’ll be able to grab on-the-go over the next few days. Which is super exciting. Because, as I learned this morning both by reading about the nutritional profile of buckwheat and by how I felt after eating several waffles (energized and satiated, without any sugar craving), they’re actually quite nourishing. If you’re curious, here’s a link with more information about the wonders of buckwheat. (http://bit.ly/1ihIQsg) Here’s my adapted version of the recipe. Put the bacon fat and butter in a 2 or 3-quart saucepan and heat over low heat until both are melted. Add the milk and heat for another 2 or 3 minutes, until it’s just warmed through. While it’s heating, whisk the flours, yeast, and salt together in a large bowl that will accommodate at least 3 quarts. The batter will double in volume. Slowly whisk in the warm milk, continuing to whisk until the batter is smooth. In a small bowl, whisk the eggs, maple syrup, and vanilla. Scrape the mixture into the batter and whisk just until incorporated. Cover the bowl and refrigerate for 9 – 23 hours. Remove the bowl from the fridge about an hour before you plan to start making the waffles, to let the batter rise a bit more. (This is not in the original recipe, but I found that the batter had not really risen very much. I think it’s because I used regular yeast, not rapid-rise. (If you used rapid-rise yeast, skip this step and let the bowl stay in the fridge an extra hour.) Heat a waffle iron. Gently fold the pecans into the batter, which will deflate to about 4 cups. Ladle the batter into the waffle iron in accordance with the manufacturer’s instructions (or your experience), and cook until crisp and lightly browned. Serve with maple syrup. If you have leftovers, I encourage you to freeze them for later. Just like the waffles you see in the freezer section at the grocery store, but better! Thankfully, while I sympathize with this fictional depiction of routine as self-care, my version of the breakfast taco (like my life) is a bit different. First, I’m a fan of flour tortillas, at least for tacos. Unlike corn tortillas, they don’t crumble, and the unassertive flavor provides a nice backdrop for the filling. I also prefer the texture of flour tortillas here. Second, I think srichacha works better than salsa verde with this combo. 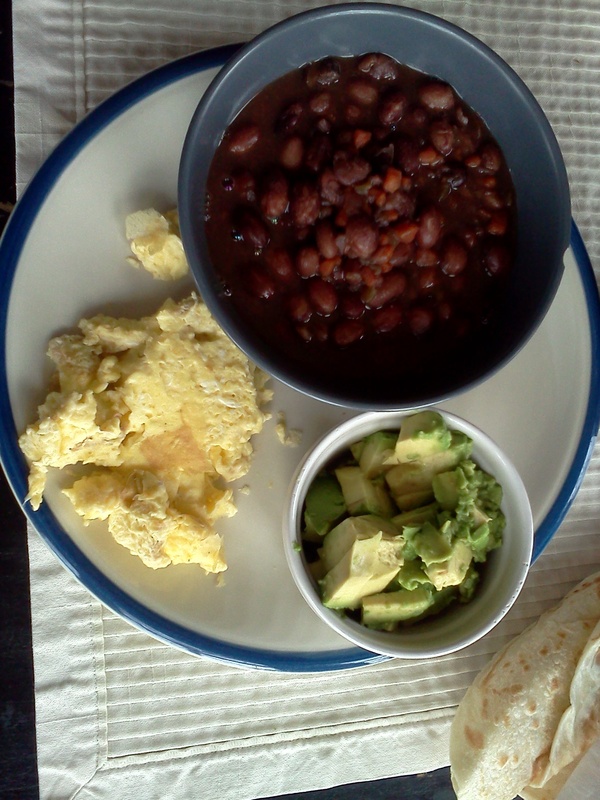 The sweet spice cuts nicely against the earthy beans and rich egg. Finally, beans! 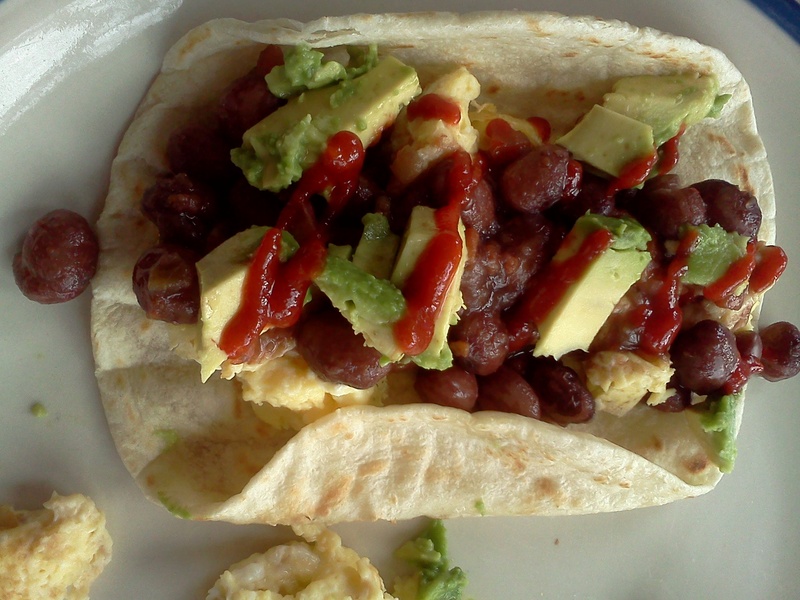 I was inspired to make these tacos not by a fellow divorcee, but by what I had in my refrigerator. Which, thankfully, almost always holds something good. 1. Heat about a cup of beans, with some of their pot liquor, over low heat. 2. Heat a cast-iron or nonstick skillet over medium high heat. When hot, cook each of the tortillas for about a minute per side, giving them an occasional spin, until lightly browned and pliable but not crispy. Wrap the tortillas in a kitchen or paper towel to keep them warm, set aside, and reduce the heat under the skillet to medium low. 3. Whisk the yogurt and salt into the eggs. Cook the eggs in the same skillet that you used to heat the tortillas, turning occasionally, until light and fluffy. Serve with the avocado, salsa, and, if desired, cilantro. You could also add cheese and yogurt (or sour cream), but I don’t think you need either. I still haven’t made a light box. But here’s a naturally lit photo of the separate components. And my place mat. Which I love.